It's a clone of the Maruzen L96. Test model chrono'd at 450fps with the velocity reducer removed. VERY accurate to over 50 metres. The velocity reducer is installed as standard and drops the velocity to approx 290+ FPS. It is easily removed, however the rifle must be partially disassembled for you to gain access to the piston nozzle. Please also note that even at 290FPS, you must use 0.30g BB's or heavier for ultimate accuracy, unless you change the hop-rubber for a softer composition. adjusting the hop up and making the scope attach to the rail and a bipod. pretty heavy. Good sign for a rifle though. So, I'll start with the back. grip over to put your hand in thats very nice. trigger back, then the whole thing to make it fire. bolt. Put that up. there's a safety push it Forward to fire and back is to put it on safe. pull the bolt back but you can't pull the trigger forward. The scope would mount onto the rail system. You can mount any other optic or laser of your choice that fits a rail. The magazine well and pop up is located on the underside of the gun. clockwise to reduce. i think but don't quote me on that. The bolt is very lubed up. it's very greasy But it's good. The barrel is extremely long, as you can see in the photos. silencer, if you feel the need to mount one. 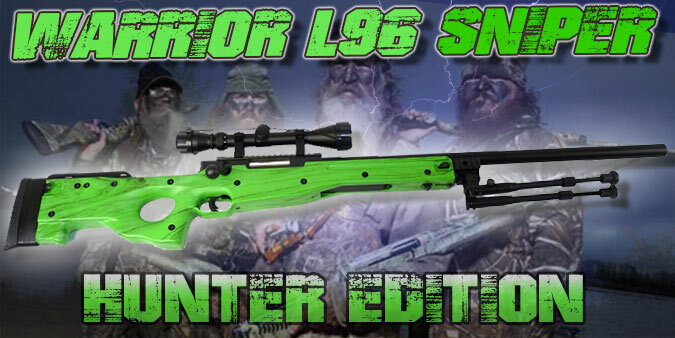 That's been my review of the Warrior L96 Airsoft rifle. A Great gun."